Skeletal muscle weakness is present in patients with COPD and this weakness can affect lower limb strength. Strength training can improve muscle strength, peak work capacity and endurance time. A combination of strength and endurance training results in greater increases in both strength and endurance than either form of training alone. 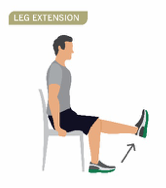 Strengthening the muscles in the lower limbs is important as these muscles are used everyday. A relationship has been shown between lower limb strength and lower limb work capacity. Having stronger lower limb muscles may help patients to perform short bursts of activity (such as getting on a bus), and may also reduce falls. Although there is no direct comparison of fall rate between people with COPD and age-matched healthy population, previous studies suggested that people with COPD have a higher prevalence of falls (44 to 51%) (Roig et al., 2011; Beauchamp et al., 2009; Beauchamp et al., 2012)11-13 compared with community-dwelling older populations (29 to 33%).14-16 The level of balance impairment and fall rate increase further after hospitalisation in people with COPD.17 Falls can be caused by a number of risk factors such as reduced lower limb muscle strength, decreased daily physical activity and reduced standing balance capacity and these risk factors are also associated with COPD.18,19 As a result, maintaining and enhancing balance is important especially for patients with a balance deficit or those with an increased risk of falls. Strengthening the muscles in the upper limbs is also important as these muscles are used everyday. Studies indicate that strength training for the upper limb muscles results in moderate improvements in upper limb strength.20A relationship has been shown between upper limb strength and upper limb work capacity for patients with COPD which suggests that having stronger upper limb muscles may help patients perform functional tasks (i.e. 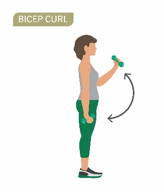 by enhancing the strength of the biceps and triceps muscles). Exercise may be continuous or completed in an interval format. Continuous training is exercise at a prescribed intensity for the duration of the exercise period. Interval training is brief periods of high intensity exercise alternated with short periods of recovery (either rest or low intensity exercise). The total duration of exercise at the desired intensity still needs to be completed, therefore the duration of the exercise session will be longer (accounting for rests) than if the exercise was performed continuously. Interval training may be preferable for patients who cannot sustain the prescribed intensity for the required duration of continuous exercise (i.e. due to severe dyspnoea, marked oxygen desaturation during exercise, signs of significant fatigue or presence of symptoms from co-morbid conditions, eg claudication pain). Intermittent training may be needed in patients with severe disease or those who are very deconditioned. Intermittent training is short duration continuous exercise (e.g 5 minutes) followed by a rest and repeated to build the prescribed duration. A training circuit can be prescribed, that includes flexibility, stretching and balancing exercises. Circuit training should not replace lower limb endurance training unless there are stations within the circuit that replicate endurance training (e.g. 15 minutes of cycling and 15 minutes of walking at appropriately high intensities). At present, there are no randomised controlled trials evaluating the effectiveness of circuit training in patients with COPD. Warm-up and cool-down exercises can be included in exercise training sessions. Flexibility, stretching and balance exercises can be included as part of the warm-up and cool-down section of each exercise session. An adequate strengthening program can be devised with or without weight equipment. Exercises should be performed slowly and smoothly. Hold the knee straight for five seconds, and then relax. Lean your back against a wall, you can use a fit ball between your back and wall to make it easier. 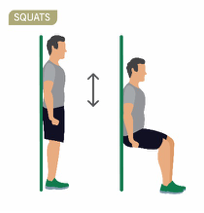 Squat down until your thighs are parallel with floor (like you are sitting on a chair). Slide up the wall to a standing position. Start with only sliding down a short way. Increase depth of slide down. Your instructor can help you with this exercise. Increase the number of steps. 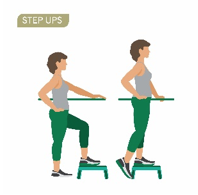 Increase the height of the step (or walk up two steps at a time). Carry a weight on your back using a backpack. Tip: It is often advisable to perform lower limb endurance training as a “warm-up” before strength training. 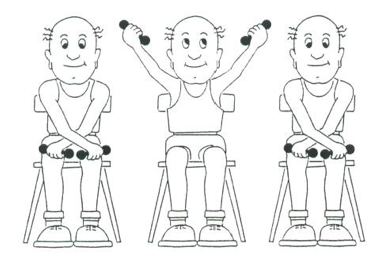 Examples of upper limb strengthening exercises without weight machines are listed below. The program Exercise Professional needs to review the most appropriate exercises based on the patient’s active range of motion (ROM) and consider any past or present shoulder/upper limb musculoskeletal concerns. Hold a weight in each hand at shoulder height. With one arm, lift the weight straight up and down. Breathe in while lifting the weight up, and breathe out while lowering the weight down. 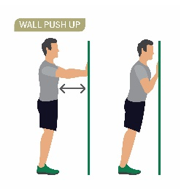 Repeat the exercise with your other arm. Start with your arms by your sides. Bend your arm at the elbow to lift your hand towards your shoulder, then lower. Add hand weights as necessary. This exercise can also be done in the sitting position. Ellis, B. P. T. & Ries, A. L., 1991. Upper Extremity Exercise Training in Pulmonary Rehabilitation. Journal of Cardiopulmonary Rehabilitation and Prevention, July, 11(4), pp. 227-231. Lat/chest pull down for latissimus dorsi. Choose an exercise with a weight that can be performed a maximum of10 times with correct technique (ie 10 RM). Start with a weight of 60 to 80% of the patient’s 1 RM weight. Perform one set (10 repetitions) of a particular exercise. Aim to increase the weight up to 80% of the patient’s 1 RM while ensuring that the patient performs the exercise with the correct technique. After the patient can perform three sets of an exercise, the weight may be increased. *Caution: Testing pulmonary rehabilitation patients for their 1 RM may not be advisable. There may be concerns regarding joints, ligaments and bone density in many of these patients. Use a sub-maximal test to estimate the patient’s 1 RM. The patient lifts a weight that they can only lift 2 to 3 times; this weight is taken as 80% of the patient’s 1 RM. From this, the 1 RM can be calculated and the intensity prescribed as for the 1 RM method (see above). Use a weight that the patient can only lift 6- 10 times. Perform one set (10 repetitions) of a particular exercise, then rest. Try to limit the rest period between each set of 10 repetitions to less than two minutes. Once the patient can perform 3 sets of a particular exercise, the weight can be increased by 5% or between 0.5 kg to 5 kg depending on which muscle group is being trained. For upper body strength training, ask the patient to move their arms up as they breathe in, and down as they breathe out. 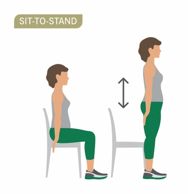 These exercises can be performed in the sitting position, with the back supported. 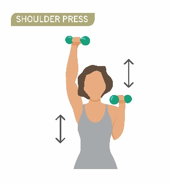 These exercises should not cause significant discomfort to the shoulders. The duration of a strength training session will be the time it takes to complete the appropriate number of sets. The frequency for strength exercise sessions should be two or three times per week. Patients should ensure they have at least one day of rest between strength training sessions.